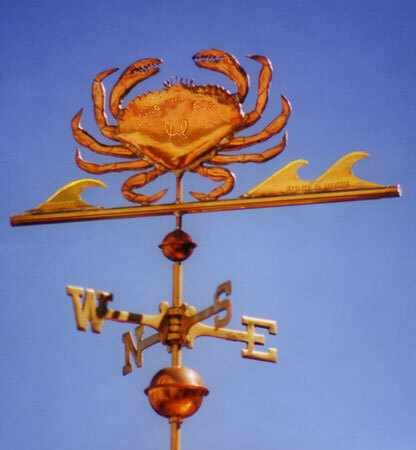 The Dungeness Crab Weather Vane, Metacarcinus magister, featured here is a hand crafted copper crab fabricated in the swell bodied style in silhouette brass waves. As these two similar metals weather and then patina their will remain a subtle difference in their coloring. If a stronger contrast is preferable there is optional gilding available to create areas that will remain bright for many years. This design was originally commissioned by a couple in Sequim, Washington, an area world famous for their Dungeness Crab. This species of crab inhabits eelgrass beds and water bottoms on the west coast of North America. It typically grows to 20 cm (7.9 in) across the carapace and is a popular seafood prized for its sweet and tender flesh. 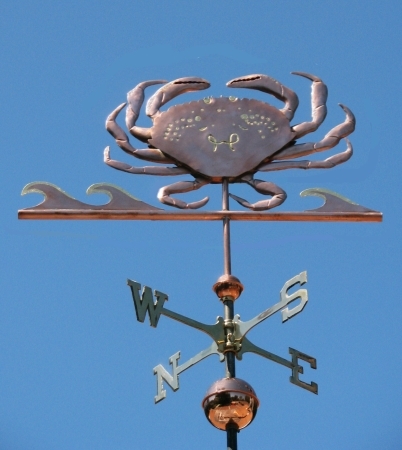 Because we specialize in custom weather vanes, we could easily make different kinds of crabs as well, many of which would have an equally distinctive profile against the skyline. Please contact us if you are interested in discussing a new design idea. The Crab is also one of the signs of the zodiac, making it a popular birthday present for someone whose birthdate is June 21 through July 22nd. Cancer, or the Crab, is a relatively small constellation with mostly faint stars that lies in the northern hemisphere. In Greek mythology, Cancer is identified with the crab that appeared while Heracles was fighting the many-headed Hydra. The crab bit Heracles on the foot, Heracles crushed it and then the goddess Hera, a sworn enemy of Heracles, placed the crab among the stars. 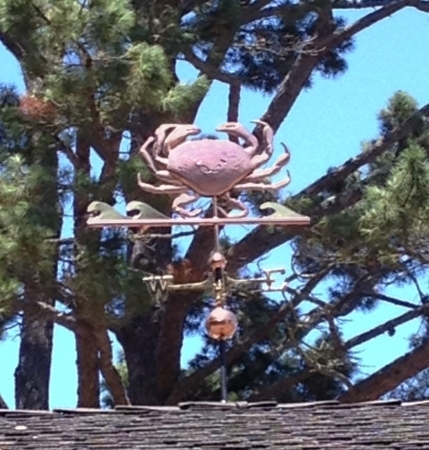 Another popular association for this weathervane, especially for those who are astronomically inclined, is with the Crab Nebula. The Crab Nebula is a supernova remnant and pulsar wind nebula in the constellation of Taurus. It was first observed and recorded by Chinese astronomers in 1054. At an apparent magnitude of 8.4, comparable to that of the largest moon of Saturn, it is not visible to the naked eye but can be made out using binoculars under favorable conditions. We were lucky enough to observe this fascinating nebula ourselves at the Kitt Peak Observatory in Arizona.